Sarah's a marketing manager from 9-5, and a make-up artist and keen cook outside of working hours. She recently started the food blog Food=Love, where she regularly shares her easy-to-emulate recipes. I've visited Turkey a number of times and I love Turkish food: it's just so fresh and tasty. One of my favourite appetizers has to be Sigara Boregi or Borek, which are cigar-shaped filo pastries filled with feta cheese. Mix all of the filling ingredients in a bowl. 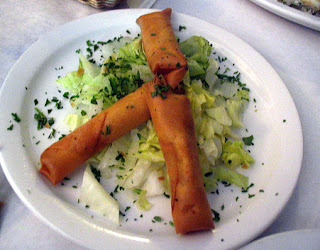 Place the three sheets of filo on top of each other vertically and cut in half from top to bottom. Then cut from one of the top corners to a bottom corner diagonally across to make 12 triangles of filo pastry. Cover the pastry with a damp tea towel until ready to use or else it will dry up and become difficult to roll. Put one heaped teaspoonful of filling along the long side edge of each triangle of pastry. Then fold the two end corners in and roll up the triangle. Wet the open end with a little water from your bowl and press it closed. Be careful not to overfill or they will explode when frying! Repeat until you've rolled all the sheets into cigar shapes. Heat up the sunflower oil on the hob in a pan on a high heat. A good way to check if the oil is hot enough is to put a small piece of filo into the oil. If it starts to sizzle, then it's ready. Turn the heat down to medium. Fry about 3 borek at a time (depending on the size of your pan) and fry the borek until they are a light golden colour. When they are done, use a slotted metal spoon to remove them and place them on a paper towel to soak up any extra oil. Serve warm with houmous and salad as a light snack or alone as an appetizer.